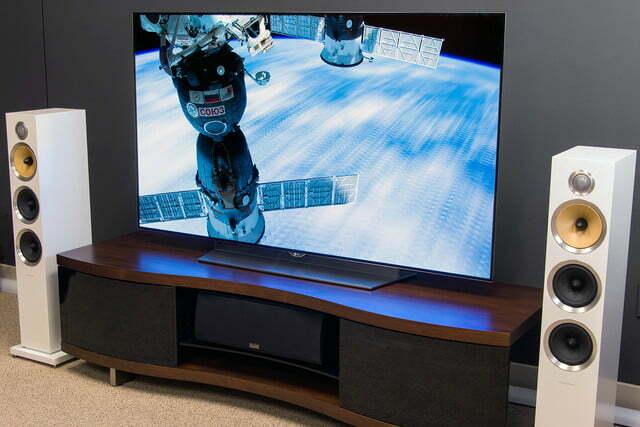 Without a doubt, the LG EF9500 is the most spectacular TV we’ve ever tested. I have never wanted to own a TV so badly in my life. When I was 10 I wanted a TV for my bedroom more than I wanted a waterbed. When I picked my family’s new TV at 16, I wanted a new Toshiba 36-inch more than a car. When I was 26, a Sony Grand Wega took priority over finding a girlfriend – I got neither, by the way. And just 8 short years ago, I lusted after a 60-inch Pioneer Elite Kuro signature series plasma almost as much as I needed the house I ultimately put a down payment on instead. 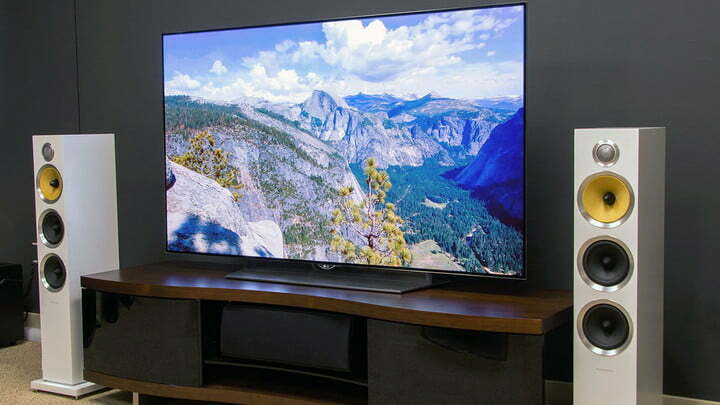 If you’ve not seen an OLED TV in action, prepare yourself for a revelatory experience. That’s four times over four decades I was prepared to put a TV ahead of, shall we say, more practical life possessions. Now I find myself in that same position, lusting after an expensive, state-of-the-art TV when I should probably be thinking of my kids’ college education fund. Will this be the TV that finally seduces me to pull the trigger? LG’s new EF9500 series flat OLED TV is almost exactly like its curved predecessor (the EG9600) save the curve and the fact that it can handle HDR content, both streamed and delivered via HDMI. 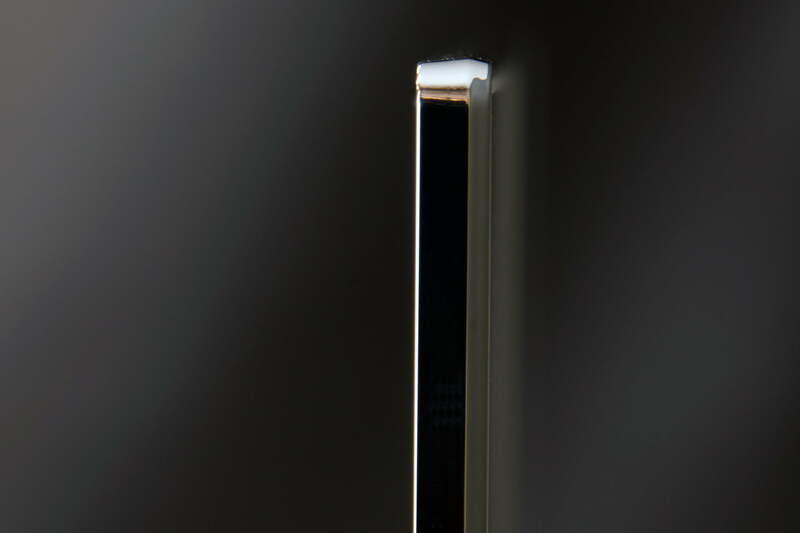 So it would be fair to ask why I am so moved by this particular LG OLED when the last one failed to get a perfect 10. The answer, I believe, lay in the fact that I evaluated the EF9500 in my home among family and friends for nearly a month, and now that there’s a big gaping hole in my living room (and heart) where it once stood, all I can think about is getting it back. Here’s why. As the first flat 4K OLED, I think the EF9500 is going to appeal to a wider audience than the curved version. You’d think the curved TV would turn more heads, but, for me, the curve has lost its shine over the past couple of years, and, besides, this flat TV shows off its thin figure far better. I had the curved EG9600 in my home for a short time and the reaction was generally along the lines of “huh … what’s with the curve?” whereas with this flat version, the TV’s super slim profile caught far more attention – at least until I turned it on. 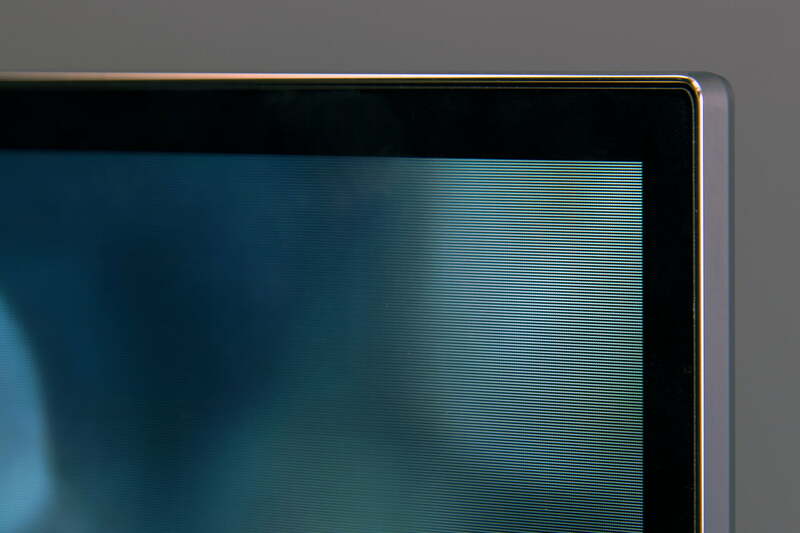 When you stare head-on at the TV, its ultra-thin bezel adds to that sense of slim and allows the TV to give the impression that it is “all picture.” I think this TV’s stand is really well designed, too. It doesn’t call undue attention to itself and helps the TV appear to float above your media stand. The EF9500 will look great wall-mounted as well, but I think bringing the TV out from the wall on a stand really sells its aesthetic. A few small improvements LG made for the EF9500 make it one of the easiest-to-operate televisions on the market. A lot of that has to do with LG’s WebOS 2.0 operating system, along with a redesigned version of its Magic Motion remote control. The remote is now slightly larger, which allows for a few more buttons and a better layout. 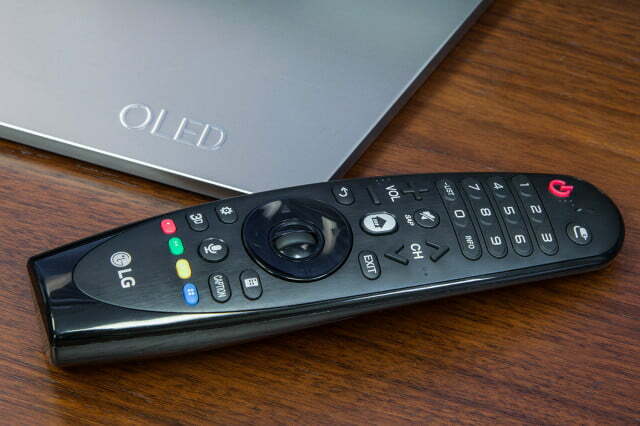 The remote now rests more comfortably in your hand, and it no longer wobbles when you set it down on a table. As the first flat 4K OLED, I think the EF9500 is going to appeal to a wider audience than the curved version. LG has also changed the system’s motion sensor so that the motion control feature doesn’t activate unless you shake the remote around for a few seconds. That’s a nice improvement – now the pink pointer no longer pops up constantly, interrupting the viewing experience in the process. A dedicated input button on the remote also makes switching inputs super easy. Now you can quickly cycle through your favorite apps and channels on a scrolling app ribbon residing at the bottom of the screen. Otherwise, the EF9500 is every bit as snappy as its predecessor. Its quad-core processor keeps app loading times short, navigation brisk, and allows quick switching between apps by leaving them running in the background. No matter how hard we taxed the TV, it remained stable, and that’s a big deal for a smart TV these days. The EF9500 brings a few new features along with its flat screen, the most notable of which is its ability to display HDR (high dynamic range) content in 4K Ultra HD. For now, most users have little HDR content they can access — Amazon is the only streaming video service WebOS 2.0 can access with any HDR content, and it only has a few TV series titles: Mozart in the Jungle, Red Oaks, Transparent, and Bosch – but Netflix is expected to start streaming HDR before the end of this year, and Amazon should be adding more titles soon. 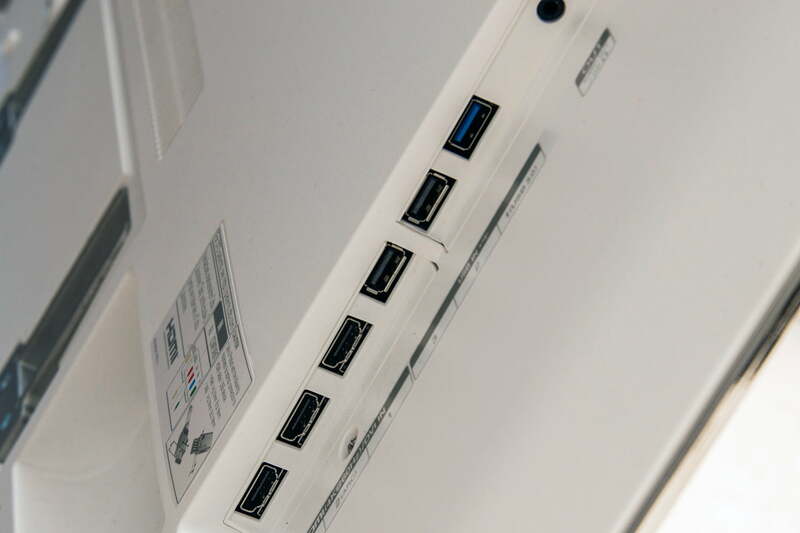 Thanks to an HDCP 2.2-compliant HDMI input, the EF9500 can be connected to a hardware source supplying HDR video. 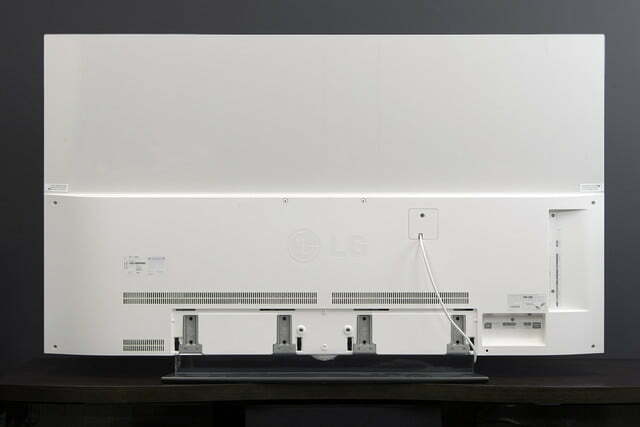 This will most likely take the form of an Ultra HD Blu-ray player, expected to hit store shelves in early 2016. The EF9500 also employs an anti-glare coating on its panel, which results in significantly reduced glare. We’re particularly pleased with this feature, as it avoids dulling the picture, while providing a much more vivid viewing experience in bright rooms. Anyone who has read anything I’ve ever said about OLED TV technology knows that I was already an unabashed fan. Still, something about the EF9500 gets me even more excited. Is it the flat screen? The promise of HDR? Probably a bit of both, along with the fact that I lived with the television for a solid month, and I, along with each and every person I showed it to, had nothing but overwhelmingly positive things to say about it. 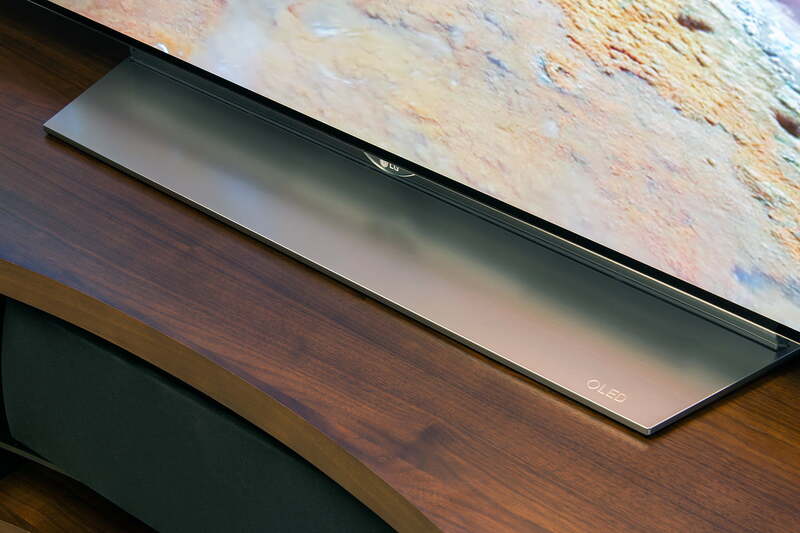 If you’ve not seen an OLED TV in action, prepare yourself for a revelatory experience. Once you see what true black does for an image, you’re not going to want to go back. Even the brightest LED/LCD TVs can’t beat OLED at the contrast game, because they simply can’t get as dark in the blacks. Also, OLED TVs have no backlight, so they’ll never show halos around bright objects or have any light bleeding from around the far edges of the screen, both of which are issues even the best LED TVs suffer from. Anything but OLED is a step in the wrong direction for TV. 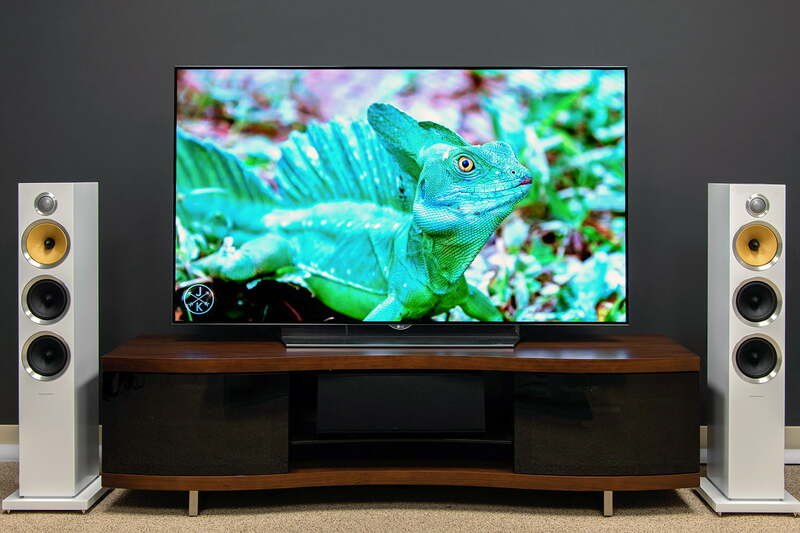 Beyond OLED TVs inherent superiority in these areas, the EF9500’s color is exceptionally good right out of the box. I do feel as though whites take on the slightest greenish cast at times, but only at certain brightness levels. I quickly got over this hang-up, though, as the TV’s picture is a somewhat overwhelming feast for the eyes. Overall, the EF9500 was a joy to have in my home, and as I’ve already disclosed, I am deeply disappointed to see it go. My only consolation is that LG will make a new one for next year, and perhaps then I’ll be able to justify snatching up a new television. For now, I’ll leave it this: The EF9500 is the finest TV I’ve ever tested, and if money is no object, I wouldn’t hesitate to give this TV my top recommendation. While the entire industry is embracing HDR in one form or another, everyone’s at odds with each other about how to deploy the technology. There are competing formats, and different flavors of HDR processing at play. Still, I’m excited for what HDR will bring us in the future, and I think the EF9500 is going to be ready to deliver. For now, though, I have to say I’m not wild about Amazon’s implementation of HDR – or its use of HEVC (H.265) compression for 4K Ultra HD content, for that matter. When HDR was engaged, I noticed blacks took a hit, turning from inky to dusty. I did appreciate the brighter spectral highlights, but when a TV’s most desirable attribute is its black levels, don’t mess with it! I want to see what this TV can do with Netflix’s HDR implementation. Or better yet, someone send me an Ultra HD Blu-ray player! HDR might just be the coolest new feature in TV land — even better than 4K. Here’s everything you need to know about the burgeoning technology and what it’s capable of. The compression streaming services must apply to make such huge 4K movies streamable really takes its toll on the bit-rate, and the lower the bit-rate, the messier the picture gets. From a great distance, it isn’t too noticeable, but get within eight feet of a 65-inch TV, and you’re going to see the big blocks, especially in darker areas. I really had hoped for something better out of HEVC. I’ll continue to remain optimistic, though. In the meantime, I would suggest anyone who wants to test drive streaming 4K UHD content on their new OLED head over to YouTube. Believe it or not, I think YouTube’s use of VP9 compression works really well – it certainly does little to take away from the breathtaking video work done by Jacob and Katie Schwarz. The couple’s YouTube channel features 12 videos shot with a Red Epic 4K camera, and they are a great demonstration for the EF9500. 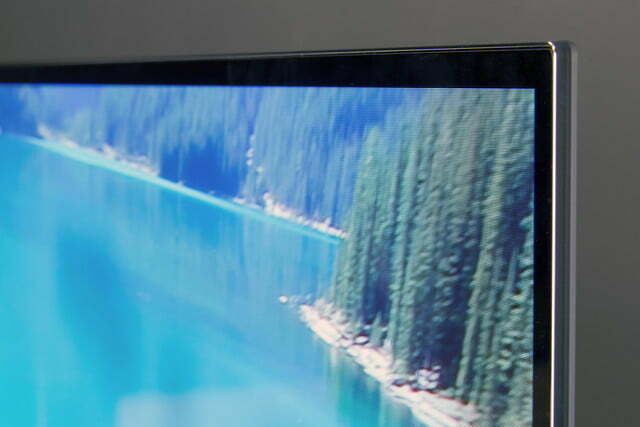 If you purchase this TV, you owe it to yourself to check them out. It’s free 4K content, and it’s of fantastic quality. I’ll grant that OLED TVs still have room for improvement, but even current OLED picture quality is so vastly superior to that of an LED/LCD TV that I find it easy to forgive OLED’s few shortcomings. If you go out of your way to find flaws, you’ll find them. For instance, the very outer edges of the 65-inch screen I tested were ever-so-slightly dimmer than the rest of the screen, but I was only able to expose this by using test patterns that would exacerbate the issue. Of the 75+ folks that I showed the TV to, exactly zero noticed any screen uniformity problems, whereas I did get a few comments about the same issue on the EG9600 curved model. It’s simply less (or not at all) noticeable to most viewers. While the entire industry is embracing HDR in one form or another, everyone’s at odds with each other about how to deploy the technology. I also saw some vertical bands using some of the same test patters mentioned before, and once I was keyed into their presence, I went out of my way to try to spot them when watching regular content. A few times I was able to catch the bands, but I knew exactly where and when to look. Again, for perspective, nobody I demonstrated the EF9500 to saw any of this. They were probably too distracted by the OLED’s incredible black levels and contrast – as most folks are. Finally — and this is a sore point for me with OLED TVs — judder continues to be a problem when viewing 24 fps content (basically, movies). My go-to torture test is the movie Skyfall, which has several scenes that tend to light up an OLED TV’s judder problems. I was hoping I could avoid going into the EF9500’s TruMotion section, and for a while I did, but I ultimately settled on doing the same thing I did with the EG9600: Leave the de-judder setting at 0, and turn the de-blur setting up to whatever level is most comfortable. When watching Skyfall, that number for me was 10, but for most content, I was satisfied with the results at much lower settings, somewhere between 2 and 4. Experiment yourself, and go with what you like best. I feel like a broken record when I say it, but it’s LG’s fault for continually improving its OLED televisions, series by series, so I must say it again: This is the finest TV LG has made to date, and I would argue, the finest TV you can buy right now. That may change when Panasonic unleashes in the US the THX-certified 4K UHD OLED it showed off at IFA, but for now, LG’s near-perfect EF9500 gets the trophy for a spell. And right now you can get this award-winning TV for $5,000, with prices likely to fall even further in coming months.